A frantic day of Gymnastics came to a close on Sunday afternoon at the Essendon Keilor Gymnastics Academy with several first time competitors stealing the spotlight. With the school holidays just around the corner excitement is already paramount in many households around Melbourne. This was increased exponentially yesterday with as hordes of gymnasts had the opportunity to harness their energy across the floor, bars, vault and beam disciplines. Before the competition began the enthusiasm was clear as all competitors took to the floor for a 20 minute warm up, which also served as an opportunity for them adapt to the main stage, a task which many of them took in their stride. 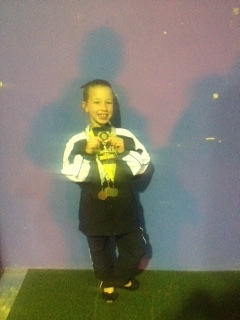 Among the highlights of the afternoon was Seven year-old Emma Ward of Gowanbrae who showed great prowess across the afternoon collecting a Gold medal on the Floor as well as two Silver medals on the Beam and Bars respectively, which combined to propel her EKGA White outfit to a second placed finish. Despite showing early signs of nerves, Ward quickly settled, saying after the competition it was merely a case of doing what she knew best. The success of her first competition will act as a great springboard for Ward, who will compete in three more competitions over the next month.